Today in Masonic History Angelo Soliman passes away in 1796. Angelo Soliman was a prominent Nigerian-born Vienna citizen. Soliman was born Mmadi Make sometime around 1721 in what is modern day Nigeria. His actual birthday is not know, later in life he adopted September 11th, the day he was baptized, as his birthday. His name Mmadi Make is tied to a prince class in the area he was born. As a child he was captured and brought to Marseilles as a slave. He was educated by the court he was sold to. Out of affection for a household servant named Angelina, he adopted the name Angelo. After numerous requests he was given to the Imperial Governor of Sicily who was also a prince. He became the Prince's valet and traveled everywhere with the Prince, even into battle. In one battle it was reported that Soliman saved the Prince's life. This would end up paving the way for Soliman to gain his freedom. He would later marry Magdalena Christiani, a young widow and sister of a French general. 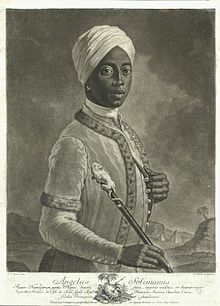 Despite living as a slave, Soliman was a highly cultured individual and his presence was sought after in Viennese society. Through the Masonic fraternity Soliman came to know Wolfgang Amadeus Mozart. Occasionally the two sat in lodge together. It is believed that Soliman is the inspiration for the character Bassa Selim in Mozart's opera The Abduction from the Seraglio. Despite Soliman's standing in Viennese society he was still outcast. During his life he was viewed as a model for the "assimilation" of Africans into European society. It was after his death on November 21st, 1796, that Soliman's treatment in their society becomes shocking. Instead of being allowed a Christian burial, Soliman's body was taken and instead of being treated like the member of Viennese Intellectual Society that he was, he was turned into a stuffed exhibit in the Imperial Natural History Collection. His remains were adorned with various items that were seen as traditional African and despite many requests from his children to have the remains returned, they never were. His remains burned during the October Revolution of 1848. The treatment of Soliman's remains to some degree stripped him of the standing that he had in life. Regardless of the treatment his remains received Soliman was a well recognized member of the intellectual society of Vienna. Soliman was a member of "True Harmony" Lodge. He would eventually become the Worshipful Master in the lodge and began influencing Masonic ritual adding scholarly elements into the rites. This would have an influence on Freemasonry throughout Europe.